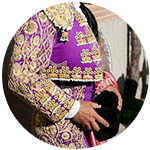 The province of Jaén has one of the largest number of bullrings and celebrates more bullfights of our country. Segura de la Sierra has one of the oldest, quadrangular, and in Úbeda, Baeza, Linares and Andújar we find jewels built in the nineteenth century. The town of Jódar celebrates its Royal Fair at the beginning of September, so named because it was founded by Royal Decree of Isabel II in 1837. The Real of the Fair 'El Caballo' is considered one of the best in the whole province. Concerts, festivals, attractions ... thousands of galdurians meet for all their stands. 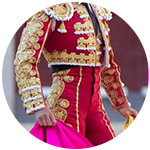 The Real Fair is celebrated from September 1 to 5 and the bullfighting festivities are a fundamental part. 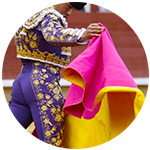 In addition to bullfights at the Fair, a charity festival is usually held in the spring. How to get from Jaén to Jódar: Jódar is to 71 km from Jaén (1 hour drive from Jaén). How to get here | Driving Direction. 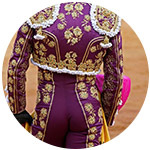 The horse-bullfighter Sergio Galán was the winner of 2018 with El Fandi. Both left the bullring on shoulders after cutting four ears and three and tail respectively, with Manuel Blázquez bulls. Javier Conde completed the poster. 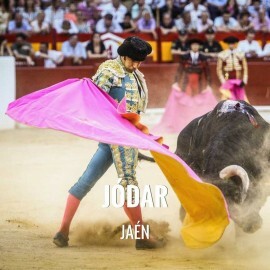 We regret to inform you that, currently, Servitoro does not have tickets for this show, but we recommend other bullfighting experiences a few kilometers from Jódar. If you need more information you can contact us by email servitoro@servitoro.com or calling 0034 963308593 (Hours: Monday-Friday 9.00am - 8.00pm). Servitoro, bullfighting breakink news Jódar Bullring, Jaén.